Local firefighters took part in a 12 hour course to learn about handling emergencies at the airport. Firefighters from the area gathered to learn how to handle local aircraft emergencies this past week. This twelve hour class is offered through the Mississippi State Fire Academy, and was instructed by Academy Adjunct Instructor and New Albany Deputy Fire Chief Mark Whiteside. “The purpose of this class is to introduce local firefighters how to handle aircraft and helicopter incidents regardless of types of engine or issues that may arise. “The local responders are our first defense in handling these issues, and controlling the scene in a rural setting, whether it be at the New Albany/Union County Airport, or offsite,” Whiteside stated. “This is the first time this class has been offered, and it is a very good class for ALL EMERGENCY RESPONDERS. It gave all fire department personnel an opportunity to train as a group in the event of an emergency involving any type of aircraft. New Albany Fire/Rescue has four firefighters that are currently certified as NFPA 1003 Aircraft Rescue Firefighters, and now with this class there are over forty New Albany and Union County Volunteers who have been instructed on the basics of this course. 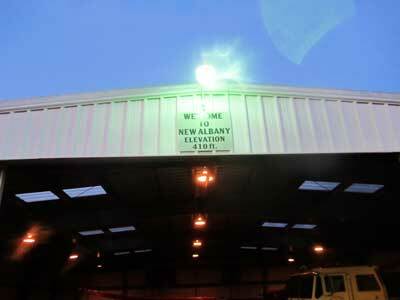 New Albany Fire, along with North Haven are always dispatched to the airport on any incident. The airport is in the North Haven Volunteer Fire Departments response district. Now, with this class, all county fire departments that may need to respond for water, trucks, or manpower have a general idea what to expect. Currently Union County has four ARFF trucks that were obtained from the Forestry Service to be used as brush trucks, but are available to use in the event of an aircraft emergency. “These trucks are no longer certified as Aircraft Rescue Firefighting Truck(ARFF), but they have foam capabilities, front bumper and roof turrets (nozzles) and off road abilities, so why not use any and all resources we have at our disposal,” Whiteside added. “I believe the general public has no idea how much activity, or what is offered (at the local airport), which includes a self-serve fuel station. It would suprise them how many flights come and go at our local airport. We were informed that somewhere in the vicinity of 12,000 was thought to be the number, which includes landing or taking off. We can recall at least three reported incidents at the airport where a crash landing or take off was reported. Add to that, there have been other incidents in North Mississippi involving ultralight planes or helicopters, either in the rural setting or at other airports.